I’m thrilled to have Eric Bandholz on the show today. Eric runs the successful beard care company BeardBrand.com, which has grown into a 7 figure business in just 12 months. In today’s interview, you will learn how Eric grew his business quickly by focusing on branding and exposure via word of mouth. He’s got a great backstory and knows a ton about how to establish a brand and how to run a successful skin care business. Welcome to the My Wife Quit Her Job podcast. Today I`m really excited to have Eric Bandholz on the show. Now Eric is someone who I met at the Ecommerce Fuel conference in Austin Texas last month, and he runs the incredibly awesome site beardbrand.com. Now Beard Brand is a really successful store that sells beard care products. And what’s really cool about his shop is the strength of his brand. In fact Eric devotes a lot of his efforts towards promoting the Beard Brand name, and it has paid a lot of dividends in establishing a fanatical following for his shop. I also had the pleasure in witnessing Eric’s beard live in all of its glory last month in Austin, and it is indeed impressive and very well kept if I do say so myself, and with that welcome to the show Eric, how are you doing today? Eric: Oh man Steve what a warm and awesome intro. It’s a pleasure being here this morning and excited for the chat. Steve: I must say that the beard is impressive. I mean you see photos of it online, but in person it’s even more impressive. Eric: Well what do you know, it just grows on me. Steve: So you know give us a quick back ground story behind beardbrand.com, and how you decided to start your shop. Eric: So I used to work for Merrill Lynch as a financial advisor and that is pretty much the antithesis of a big bearded image. It’s all about the all American boy that– the suits and the beardless faces and that job was really not a good fit for me. I don’t like working for the man and you know I’m a very philosophically driven guy and really in economics as well. And Merrill Lynch is core economics are different than my core economics. So it was just a matter of time before I left there, and when I left there I decided to start my own business as a freelance graphic artist and grew my beard out, so through this journey of growing my beard out I got really into it. It tried to learn all the techniques there were to grow the quickest and the fullest and groom it the best way and use the right products, and at this time there really wasn’t a lot of stuff on it, and there was this beard competition in Portland Oregon that I had to go to, everyone was talking them. So I went to my first beard competition and absolutely just like fell in love. Like this is I don’t know for all the listeners out there who have– if you have never been to a beard competition you`ve got to add it to the list of things to do. It’s like a beauty pageant for men, but there is usually a little bit of alcohol and booze involved and a little bit of debauchery. So it’s just you know a good time. What I noticed you know especially with my background in Merrill Lynch was that you know traditionally beards men were thought of as like lumber jacks or outdoors men or bikers, and I never really fit into this group, and what I noticed there was other people like me who were stylish and career driven and you know independent, and we coined the term urban beards men to kind of identify those people, and we`ve been able to unite the community and jus kind of grow from there. Steve: That`s awesome man, so just curious, did you win this beard competition or…? Eric: No there was probably about 30 people in my category, and I didn’t even get top 10. So there are– while you may think my beard is quite awesome, it dwarfs in comparison to a lot of these people at these beard competitions. Steve: So just to also be clear while you were working at Merrill Lynch you were beardless, is that correct? Eric: Yeah I mean, I would generally be completely shaven, but every once in a while I would grow out probably like one of two week long beard, so if I had any kind of facial hair it’s very-very short and very trimmed. Steve: And I do kind of understand what you are saying there. You know a lot of times there is this connotation with people having these gigantic beards with people who are kind of like back woods type of folk, and just to be clear your products kind of cater to those working professionals with beards, is that right? Eric: Right, and I want to emphasize that you know, we’re not anti biker or back woods like those are beautiful and awesome communities and as fellow beards men we really identify with those guys as well, but we decided to almost go with like a hyper niche and real specific niche and you know we`ve got a lot of customers who identify themselves more with outdoors men and kind of the bearded biker look and things like that, and that’s totally cool. So we definitely support that look as well. Steve: And just to be clear, so the products that you sell are primarily focused towards skin care, is that correct. Eric: Yeah, skin and hair care are going to be the big focus and of course the hair as in as in beard care. Eric: Like our beard oils is a leave in conditioner, it’s going to be healthful or healthy both for your skin and your beard. So it kind of has a dual purpose. Eric: You can’t really have one without the other I suppose. Steve: Okay and then you create all these product formulations yourself, is that correct? Eric: Some of them we work– we`ve done internally. We`ve developed our own platform after lots of research online and you know looking at ingredient lists of our competitors and similar products and using that as a foundation for starting, and kind of going from there. But we are also developing some new products in the future that are probably outside our expertise of developing and in house. So we are working with a cosmetics company to develop a product for that as well. Steve: Okay, and so for all my listeners who are thinking about creating or selling skin care products, like how do you begin? Like for example I would have no idea like how to create like beard oil or that sort of thing, how did you guys get started with that? Eric: So for me I was really immersed in the bearded community and listened to what a lot of people said and was doing, and I’ll be the first to admit that I didn’t invent beard oil or beard care. Like there has been other people who have been doing it, and they talk about what works for them and what doesn’t work for them and I`ve used a good number of products out there. So I kind of knew like the attributes and features that I wanted, and it was just a matter of getting high quality ingredients and since it’s a natural product, it’s something that you can develop pretty easily though product testing and trial and error and just tweaking. We’re able to come up with a formula. Steve: So how do you– is there a company that you go to do this, like how does it work exactly? Eric: So yeah within the beauty industry if you are looking to get into this, there are a lot of cosmetic companies out there who produce shampoos and washes and soaps and oils, and you know beard oils and hair oils and just anything that you can think of from a cosmetics stand point they are going to be able to do. It’s pretty you know they are the companies that are manufacturing everything; they like to be in the background, so it’s going to be very difficult to find them. One of the ways you might find them is by going to like a trade show for their cause and you can be able to connect with them there, or find other people in the industry and ask for referrals was the way that we went as well? Steve: Okay and then when it comes to actually formulating your own stuff, is it just– do you tell them that you want this ingredient or this ingredient– you kind of have to have an idea of what you want in there, right? Eric: Yeah it’s not like you can say make a shampoo and then they make a shampoo. So we tell them that it’s going to be used for beard care, we want to have you know higher end– we want it to be a higher end and nicer shampoo, sold in SOS free paradigm, free like without you know the type of chemicals that our community doesn’t want to have in their beard care. So there are like certain directions that you can point them. Steve: And so you kind of have to have an idea already or know what ingredients do what, and that sort of thing before you even get started right? Eric: Yeah, again like we didn’t just– I didn’t just roll out of bed and I was like I`m going to come up with a beard– you know a lot of research and a lot of time spent on you know– it’s funny like I was thinking about this one day when we were kind of testing things here in our kitchen, and it’s like you know I`m part sales man, part business owner, part designer, part you know finance guy and I’m also part chemist, which I thought I would never venture into. Eric: So it’s kind of interesting when you think about that when I really started like digging down into like how ingredients worked and like the attributes of various ingredients and the things to look for and consider you know I`ve got much more to learn and understand as well, and I don’t think I`m ever going to be a super wealthy guy becoming a chemist. So that will be one thing that we`ll outsource. But it is like really interesting for me because I love learning new things and getting into it. So I definitely plan on expecting to spend a lot of time learning and researching. Steve: How does the testing process work, so you have a new formulation, do you have like a bunch of people with beards that you have as like test subjects or…? Eric: Yeah there is us testing it internally, trying the product out and using it and seeing how it’s working and going, and then there is like lab testing as well where you see like how long the product will last, do you need like additional preservatives, things like that. Steve: That’s in terms of shelf life, right. Steve: I was just talking in terms of just you know the actual beard, and how it makes your beard feel and that sort of thing. Is it like kind of like a more qualitative test, or do you have like quantitative numbers that you assign to certain things? Eric: Just what I personally want with my beard care. So it’s a little bit of selfishness, but you know it’s kind of leaning on my expertise within the community as well. Steve: Okay, and then in terms of just like getting your first batch made, how much would you expect to spend? Like if you can take us back to the very beginning for your first batch. Eric: Yeah, with us I mean the beauty with our products and how we launched it, is it’s a really low cost eventually, I mean it was a couple of hundred bucks I think. Eric: For the ingredients and the sizes that we’re doing. So we’re able to just– I mean it was almost like a lot of our research and development was through the market. Kind of like a lean start up where you test it with your customer base and go from there. Steve: Does that mean that you didn’t have like a third party, I guess beauty supply manufacture make your first batch? Because I would imagine would they dabble with something so small in the beginning? Eric: Yeah we started like super small and our business– like our first month of sales were like 900 bucks, and we’ve definitely gone the organic road. So a lot of it is just kind of boot strapping and getting something done. And when you’re a young company getting off the ground, you have a brand to build, but you don’t have a brand to tarnish. So you are able to take some risks that larger companies aren’t going to be able to do. So we took some calculated risks to get our products out to the market and test it with the market and go from there. So you know if there is a listener on here who works for L’Oriel or Procter and Gamble, they would be turning in their grave for lack of a better term, probably some of our techniques and processes to get out there. But there is so much more to cosmetic business and grooming line business than the actual product. There is this actually through the process in my research I downloaded this PDF that kind of gives an intro into beauty cosmetics and what to look for and how to do it and how to formulate your own things. And so much of it is actually like the brand and the image that you are trying to create to unite the audience that you are going after. So if you think that you can simply just create this great product and put it in like a brown bottle and people buy it, then you probably need to re-analyze your strategy. Steve: Okay, that’s actually really good segway into what I really want to focus kind of like talk on, which is how you’ve been able to establish such a strong brand for your products. I mean from what I understand the audience of people who buy your products are actually very fanatical and very supportive of your brands. So I want to talk a little bit about how you did that? What are some of the things that you did early on to establish your brand? Eric: Well I think what was one of our key aspects was giving away a lot of valuable content without the expectation of anything in return. So I’ve got a YouTube channel where I’ve done a lot of how to grooming type of videos, and how to you know take care of your beard and grow it faster. Just essentially giving out free content without any kind of expectation in return, and I think that builds trust with people you know you’ve become the expert within an industry, and people trust what your are saying, trust what you are doing. And then when you do come in, make a recommendation then they’re going to connect with you. They know there’s other products out there, they may just go with you simply because they like you which is a really fun thing to do as well. Steve: So what I was going to ask you, how do you even get people to find your YouTube videos right? Because you just can’t put a bunch of videos– chances are people won’t be able to find them that easily. Eric: Yeah you know I just kind of did that. I just created videos on things that I was passionate about. And I think the beauty with YouTube is it’s still a little bit of a wild west. There is like still a lot of videos out there that don’t exist within very specific niches, a lot of guides and how tos. And the beauty of YouTube is like viewed in a channel; I guess is it takes a lot of work to create a video and a good video that has good content. So if you are able to do that, then it’s going to be pretty easy to find new stuff. Steve: So all of your YouTube growth was more or less organic? Eric: Oh yeah totally, totally. Like I didn’t do– and I guess this isn’t like you know for the listeners out there, it’s kind of annoying and frustrating and say, “Oh you just put videos out there and people found it.” But it was essentially like that; I didn’t do any kind of optimization where like, what is the title that I need to put in? Or what is you know what type keywords are people searching for and things like that. It was more of like you know this is kind of what I want to talk about and what I’m passionate about, what I’m interested in and I don’t know if there is people out there or not. So it wasn’t something that we built. You know we launch this YouTube channel and then like two months we had 10,000 subscribers. It wasn’t anything like this. This was something that took a very long time, very long process. And you know not a lot of views, not a lot of new subscribers. So I’m sure I could have shortened up that time period by optimizing my topics and really optimizing my channel. But I think there is a little bit of authenticity that comes from not being very polished. One of the YouTube guys that I follow on his channel, one of his first videos was him at a golf course like taking strokes and you know swinging at the ball. And his YouTube channel is about like electronics and technology. And it just shows that you know he was someone who is just kind of passionate about what he is talking about, and he is sharing videos on YouTube. So I think if you are trying to stand out in the crowd then stand out from the Amazons of the world, like you do need to do a little bit of that. You do need to be authentic. Steve: Did you have your YouTube channel before your store, or did come after the store? Eric: Talking in the community for about a year. Steve: So that kind of implies that your YouTube videos at least the earlier ones don’t even have a link to your site at all, right? Because you didn’t have the site. 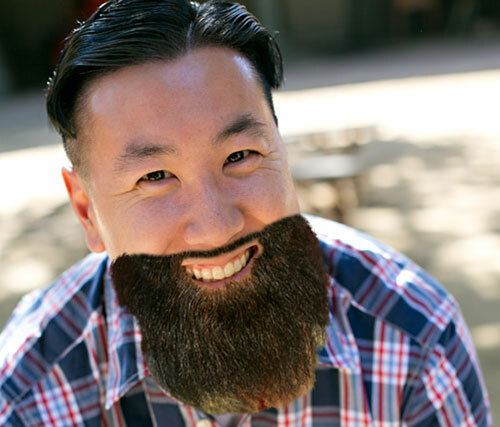 Eric: Yeah I mean I had Beard Brand, right? So I always had the name Beard Brand. And the beauty of YouTube is that you can always edit the description after the facts. So I added some links in there. And I had like my old logo on there. The older version of Beard Brand and you know I’ve played with different things, over the course of different videos like you know how I’m placing my icon on there, my water mark and things like that. But it’s always been called Beard Brand which I guess makes it easy. Steve: Okay, and then in terms of just do you measure the click throughs from those links, or I guess what I’m trying to ask is how do you know that the YouTube videos are actually what is bringing customers to your site and your brand? Eric: I just recently did a survey with our customers and how they first found out about us, and 46% found out about us through social media. And within social media, half of those people were from YouTube. So it was directly asking our customer base for direct results, and then I do do a little bit of analytics to see where people are coming from and where the traffic is coming from. And so I keep an eye out on that as well. Steve: Okay, and so you mentioned that half was from YouTube, where was the other half coming from? Eric: The other half was from Facebook was our second largest source and then Reddit was our third largest source. And which is kind of surprising I think a lot of people don’t see Reddit as a very high source of customer base, or may be for traffic they get. But we’ve been able to convert out customers, which has been a really rewarding experience. Steve: So let’s talk a little bit about Reddit because in my experience the folks over at Reddit are kind of a neglected bunch, and they’re very quick to jump on anything that is self-emotional. And a lot of cases you can get banned if you do that, right? Eric: Yeah, I mean it’s a tough community to crack and I would say that I still have many of them. The beauty was with Reddit are– is that there are sub-Reddits which is like very specific niche communities, which have their own personality. So you can’t just go to Reddit and say I understand the whole Reddit community, you have to really understand each individual sub-Reddit. And we’ve been able to build good community with the Beards sub-Reddit as well as the entrepreneur sub-Reddit has been really good to us. Steve: So what is your strategy with Reddit? Eric: With Reddit it’s pretty much just be authentic and give away content for free, and not ask for anything. And in addition to that whenever I make a post, I’m very involved. So if anyone asks any questions, I always respond to every question, spend a lot of time into it. You can’t just you know generate this giant long post and then a bunch of people ask you questions and then ignore those questions. I think probably one of the successes too is being involved in the community in addition to giving to the community. Steve: So by that did you participate for a long time before you even decided to post anything? Eric: Oh yeah, I mean I got pulled into the whole Reddit thing, like I’m definitely like a fan of the website; it’s been probably too many hours on there. Looks like I have two tabs open right now on Reddit, so. Steve: Okay. When you talk about posting an article, do you post a link to something or do you just post the entire article on there? Eric: So to get in with Reddit, it’s going to be more advantageous to do what’s called a self post, where you post the full articles straight into Reddit. They will be a lot more suspicious if you post the link, because a lot of people are just trying to drive traffic to their website. And by posting a self post to a specific Reddit, then they’ll see that you are actually trying to help the community out and help the sub-Reddit out, and I think that’s a preferred way to go. Steve: Okay, and then this article that you are posting on Reddit, is that unique to Reddit or do you use it anywhere else, or is it just for Reddit? Eric: Yeah when I post to Reddit all I’m doing is just posting to Reddit. I don’t drive it to other blogs. I have recently written a fairly in-depth extensive article, I think it’s something like 2200 words. I’m hoping to get connected with you know as a guest writer on a larger website, but if I don’t do that, then I will come in and I’ll share with the Reddit community exclusively to them. Steve: Okay, and so that’s pretty interesting. So you went out and you found a very specific sub-Reddit that I guess caters to beards, and then you started posting informational articles and just participating in that community. And that community was– a large percent of them was going to be potential customers for your products, is that kind of accurate? Eric: It’s completely different than what you would assume. But it’s good though because there is like other entrepreneurs on there, other bloggers, other people looking for content who have shared our articles that we’ve posted on the community on the entrepreneur sub-Reddit. Steve: Okay, so indirectly your efforts on Reddit have kind of just boosted your brand and your business, even though that they might not be necessarily your target customers. Eric: Yeah absolutely. So we’ll post something on Reddit and get like one or two thousand visits that day from the post. And those people you know the conversation rates are awful, like you know no one is buying, nor am I expecting them to buy. But they learn about us, they learn about the brand and then they tell their friends who have a beard, and then it kind of gets its own little growth structure. So it’s a fun process. It’s a great community out there you know it’s tough and it’s fickle and they’re very skeptical. But one if you authentic and you are true and you do want to give to the community and you know get feedback from the community, there is just a great rewarding experience. Steve: Okay, and then you mentioned the other part of your social media strategy was Facebook. So is that just driving traffic through your fan page? Like how do you run your Facebook page? Eric: Yeah, we do somewhere on our Facebook page as our Tumblr page, but at a less frequent token. What we found on Facebook that works really effective are memes, they seem to get shared a lot. Unfortunately I’m not– we are not big on memes, so it’s kind of like a patch plan to, do I post this memes with the hope that you know people like it, or what do we do. It’s been a little bit of hit miss strategy, and Facebook isn’t my favorite platform for marketing. Eric: I think it’s just a lot of people are on there and we were buying advertisements as well. So I think we’re introducing our brand through buying eyeballs as well which isn’t the best way to grow in my opinion. Steve: So buying eyeballs for the purposes of establishing a brand, or to actually drive target traffic to people that will actually buy? Eric: Yeah, when I say buying eyeballs I just mean we’re paying for advertisements. And then people would see those advertisements and come to our brand. So I’d imagine most of the traffic from Facebook that were considered social media were actually paid type of customers. Steve: Okay and then how do you kind of structure your Facebook ads. Is it just content that you are linking them to or…? Eric: Again like we haven’t really had a lot of success with Facebook. It’s not something that we really are proud of, or want to brag about or probably have a lot of expertise in it. Eric: We’ve tested like just simply buying ads in the newsfeed and on the sidebar, and then of course trying to grow our page. Currently what we’re doing now is simply remarketing. So if someone visits our website, then they will see some Facebook ads in their newsfeed as well. Steve: Okay, so how do you get customers to your shop? Like what is your main driver of converting customers? Eric: We are active on many social media platforms. So of course YouTube’s been a great driver whereas also out in Tumblr, and we are on Instagram has been one that we put lot of resources into recently. And then of course YouTube has been huge for us. So those social media aspects are great ways for us to generate traffic. We also purchase advertisement on Google AdWords. Steve: Okay and how’s that been doing? Eric: It’s been good. I think we’re getting about a five time return on investments. So if we spend five bucks, it will generate about 25 bucks in revenue. Steve: Is this just search, search AdWords, or do you do you do display network as well? Eric: So we do that, and then we do the adwords, but we don’t use their display at all. On the display we found it was just like erasing all the money we had, I wouldn’t recommend it at all. Steve: Yeah I’ve been playing around with it recently too, which is why I thought I’d ask, but yeah it’s been really challenging. Eric: Yeah it’s a good way to lose money pretty quickly. So for us personally and what’s worked with our customer base is been the PLAs and the Tech Search. Steve: Okay, then you mentioned Tumblr and Tumblr is actually something that I don’t quite understand fully myself. How does it work? And what is different about Tumblr versus just any other blog platform? Eric: So Tumblr is almost like a cross between social media and blogging. We use it as a way to curate content that fits our image, and share that seamlessly. So the beauty with Tumblr is they have a re-blogging platform where essentially you find something that looks cool, and you click on the re-blog button and it shows up on your blog. So we’re able to generate about 15 posts a day of photographs that are lifestyle photographs. And so there are more than just things that we’re creating and pushing. Steve: And so it’s kind of similar to Instagram then in what you are saying? Eric: Yeah, it’s really similar to Instagram in the sense that or how we use it is really similar to Instagram in the sense that we are posting up photographs that are really rapid paste. It’s different than Instagram in the sense that I don’t know of a sharing feature within Instagram. I know there is like an app called Regram or something like that. But there is no real like I run across a cool photograph and I’m able to just share it on my blog. So Tumblr is great for that. One word of warning is the copyright trolls will get on there. So you have to do a little bit of due diligence with the photographs to make sure that people who are uploading them have the rights to upload them, or else you could be getting random mails from them to get the images of the world. Steve: Okay, and then you know it sounds like a lot of– the majority of your efforts early on were specifically focused on building a brand and for your business. So how long did it actually take before you actually noticed some traction from your efforts? Eric: We had, well I’ll just kind of give you the number of our sales. Eric: Our first full month was about 1000 bucks. Our second full moth was about 700 bucks, we went down. And then our third month was about probably another 1000, I think it was our first three full months we had about 4500 bucks in sales. In July of 2013 we– I know this only because I just wrote this article. We had– I think it was about $15,000 in sales in July. By November we had grown to about $75,000 in sales. And then in December of that year during the holiday rush we were up to $120,000 in sales. Steve: Total or a month? Eric: That was per month, each month. So I would guess it was like the July August September time frame where the momentum really started picking up. Steve: And so basically you are saying within a year you were doing six figures per month in revenue. Is that right? Eric: We had a million dollar run rate within the first year. Steve: That is crazy. And then can you pinpoint a specific traffic source for that? Or is it just based on word of mouth and buzz that you’ve established through your brand. Eric: Yeah, it’s a pretty broad source of traffic. I don’t think there is– we’ve never really like targeted one single platform to drive business. We’ve always been pretty broad with our strategy. So it’s just gain out there, it’s talking to our customers, providing a great product, really like sending products quickly and fast and just you know a little bit of luck, but also there’s lots of other companies doing what we are doing. Eric: And they’re not– I don’t think they’ve been able to grow the way that we’ve been able to grow. So being able to really you know– the mission of what we’re trying to do and we’re not trying to self product, we’re trying to change the way society views beards men. You know we’re trying to show that just because you have a beard doesn’t mean that there should be a native stereotype with you. That there are beards men out there who are career driven and working professionals and they have families and they do good in the community as well. So that’s what we are trying to do at Beard Brand. Steve: Okay and then can you talk a little– I mean it sounds like it was very smooth sailing for that first year. Can you kind of talk about some of the mistakes that you might have made, or some things that you might have done differently if you started all over. Erick: Yeah it’s– the funny thing is you learn to do what is successful and then you become successful at it, and then you get cocky and you are there again, and you think that whatever you touch– you know you think that you have the Midas touch and everything you do turns to gold. So one of the things that allowed us to grow was by selling other people’s products, at least just being a simple reseller, and figuring out what items move the quickest and then developing those products internally. So we made like a pretty large investment into a product that was a little bit outside of our core values, and ended up with us you know not moving it as quickly as I’d like. So we have a higher inventory in a sort of moving product. Now the shelf life on the product is long shelf life, so it’s just the pain of putting all this cash in something that’s not going to pay out for a longer period of time. So really like testing the market first at least from a boot strap perspective is going to be a more effective way of growth than kind of making decisions based on your gut. Steve: Also I didn’t realize, so you started out selling other people’s products? Erick: Oh yeah, so it was probably about five months that we sold another line of beard oil and mustache wax and sold that line all the way through November as well, so. Steve: So you were carrying inventory, or was it drop shipped. Erick: Yeah, we have never drop shipped, it was always buying inventory and reselling it, and know I would recommend against drop shipping. Steve: And in terms of selling other people’s products, I imagine they were branded, right with– not with the beard brand name, is that correct? You weren’t white labeling anything. Erick: Correct, so it was under a different name and you can still buy those products online. We didn’t have exclusivity or anything like that. Steve: Okay, and then so it’s mainly the strength of your brand that allowed you to sell other people’s products and then graduate– within that first year, did you have your own products that you created from scratch as well? Erick: Yeah, it took us about five or six months to develop our own product in-house. Steve: And then gradually I guess you started replacing the branded stuff with your own stuff because the margins I imagine were a lot higher. Erick: Well actually it was– we would probably still be selling that product online if that vendor wanted us to sell it. So I think he thought the success with Beard Brand was from his products and didn’t appreciate what we were doing as a company. Steve: Interesting. That’s counter intuitive to me. Erick: Yeah, he pretty much just stopped selling us his products and so. Erick: You know, but what can you do you know, if he doesn’t want to sell to us then. Steve: For all the people who are listening out there, it’s obviously you know with the Amazons out there, it’s very important to establish your own brand. Actually I want to get your opinion on Amazon. Do you sell your stuff on Amazon as well right now? Erick: We do sell on Amazon, and it’s not my favorite platform and it drives only a small portion of our business, probably about three to four percent of our sales come through Amazon. So much of us is being a brand and company and building an image, and we don’t– Amazon doesn’t provide those kinds of tools. They’re just all about the product and product-product-product, and getting the product as cheap as possible and that doesn’t fit our business model at all. Steve: And is that something that you would– I just want your opinion here. Is that something that you think that all e-commerce stores should do? Like what is your view on selling on Amazon from the perspective of a small business ecommerce owner? Erick: I think it’s– there’s a company in Spokane called Green Cupboards who built their business by drop shipping on Amazon. So I don’t want to say if you are a small business you should avoid Amazon. It’s just– I think you really got to commit to it and understand the ins and outs of it. And one of my fears as a control freak is by not having your own platform; you are dependent on the whims of Amazon. They could change the commission structure which would totally affect your business. They could change so many things with the platform. They could kick you off, they could ban you. I mean there are certain things that go on with them that make it an un-enjoyable experience for someone who likes to be in control. But you know they have an audience as well and they could generate sales for you, you know, but yeah I don’t like them. Steve: What is your– do you use FBA? Erick: We do not use FBA yet, I think especially we’ll roll to them. Steve: So what is your motivation for using Amazon, is it just like to just kind of dip your toe in that water just to see what’s going on or…? Erick: Yeah, we had a sales person from Amazon call us and bug us and you know tell us to get our stuff on Amazon, and I was like no-no-no-no, and I’m like okay well it’s not going to be that much time investment for us, so we just put our products up there and we don’t promote it at all. We don’t push traffic there, we don’t optimize it; we don’t invest a lot of time on it. So it’s just– it’s purely capturing opportunities there that we wouldn’t be able to catch by not being on there. It’s you know all of our strategy is going to BeardBrand.com. Steve: Okay, and then in terms of the products that you do list on there, they are all your own stuff that you make yourself, is that right? Erick: Correct, there’s no other items on there, other than our beard oils and our mustache waxes. Steve: Okay, do you do anything with Pinterest at all? Erick: Yeah, we just started putting in a little more effort into our Pinterest account, and have actually gotten pretty good traction. I keep track, our growth– let me pull up our social media numbers. So with Pinterest we’re growing on a clip of probably like one or two followers a week for 69 weeks. And then actually just in July we started posting regularly and we have been adding about 30 to 50 followers per week. Erick: So simply consistent content has been a way for us to grow organically, and we’re up to about 1000 followers on air. But it’s not at a level that will really drive a significant amount of business to us currently. Steve: Okay and then in terms of your experiences with buying ads and blogs, we’ve kind of talked about this before we started talking, but is that something– is that a part of your strategy as well? Erick: Yeah, we advertise within community related websites. So something that’s going to be tied in around beard care or the bearded lifestyle, so it’s not a huge opportunity for us when we talk about you know growing to you know like what every entrepreneur wants to do grow to a hundred million dollar company. Like these websites are great for getting us off the ground and in connecting and being in tandem with the community, but they can only generate so much traffic. Like even if we got all their traffic, it probably wouldn’t be enough for us so– but it’s– they’re a great community. So you just kind of want to help support them. Steve: You know again from the perspective of someone just starting out, if you had the opportunity to just focus on a single traffic source, what would it be, what would you recommend? Erick: I would recommend YouTube. Erick: I think if you only had– well I mean for what we are selling and what we are doing? Steve: Yeah, from your perspective. Erick: Yeah, from my perspective it would be YouTube. I would put all my eggs in that basket. Erick: And probably like my second one would be your own proprietary content source. So we are generating urbanbeardsman.com which is our own content and just curate it all on one page. Again you have less long-term risk with that, but more upfront cost and burdens to get that launch and get the traffic there. Steve: I’m just curious, have you tried any YouTube advertising since you’re so heavily invested? Erick: We tried a couple of things here and there, but it wasn’t anything. It’s a very time consuming thought process because what you have to do is create a video advertisement and then you know what is that advertisement? How is it going to work? Who are you following and what are you doing? There’s a lot of things that go into it. Steve: I can imagine, I can imagine. Erick: Yeah, you almost need an ad agency I’m sure. I’m sure there are some smart people out there who don’t need an ad agency, but I don’t know if I’m one of those smart people. Steve: Whatever Erick. Hey so I want to be respectful of your time, we have already been talking for 45 minutes. You know that I was going to ask you this, but for me it takes me about seven days to grow a little bit of stubble on my face. So which one of your products would you recommend to help me grow a beard, and how long would it take? Erick: Yeah, you’re asking me a tough question here. Erick: You’ve got the Asian genetics. You’re up our wall a little bit. You know none of our products are snake oil. So we don’t do any miracle grows. What we do is just kind of products that will help take care of your beard once it grows. Erick: You can do that, it might be a little bit tougher market, but we do have some Asian customers as well. So they are out there, maybe a little more rare, but for all Asian listeners out there, give it a shot. You don’t know what you have until you try. Steve: So Erick for those people who might have questions for you, where can they find you online? Erick: Reach out to me on my Twitter account. It’s @bandholz. I’m usually pretty good about tweeting back. And if you can’t find me on Twitter, just Google my name Erick Bandholz, I’m the only one out there. So that’s also preventing me from doing bad things because I can’t shift my blame to some other person. Steve: All right Erick, cool, well thanks for coming on the show I learnt a lot, and I think it’s amazing what you have done with your brand. It’s really inspiring. Erick: Pleasure is all mine. I’m happy to be part of it and hopefully some of the listeners will be able to find value from our chat. Steve: Awesome, take care man. Steve: Here’s what I find amazing about Erick. 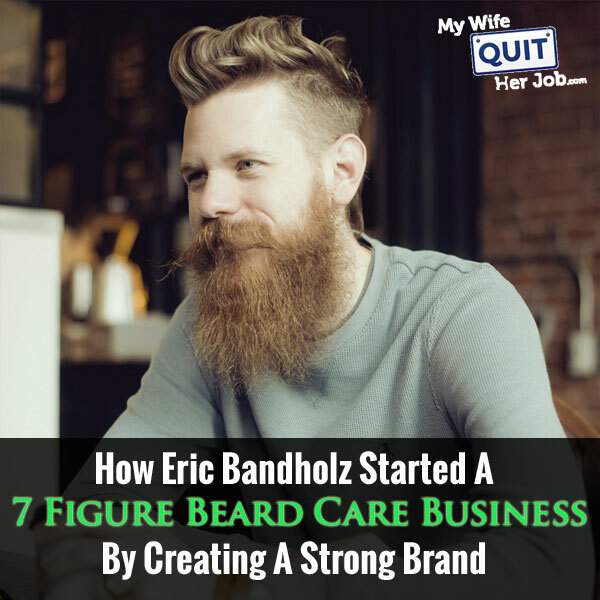 He’s established a very powerful brand with beardbrand.com by primarily leveraging word of mouth and social media, and he did all this in little over a year. And in terms of ad spent, Erick invests his money primarily for branding purposes as opposed to grading his campaigns directly on direct response. And his results have simply been amazing. Now I don’t know if any of you guys watch Shark Tank, but Erick was also recently on the show and I plan on having him back to discuss his Shark Tank experiences. For more information about this episode, go to mywifequitherjob.com/episode46 and if you enjoyed listening to this episode please go to iTunes and leave me a review. When you write me a review, it not only makes me feel proud, but it helps keep this podcast up in the ranks so other people can use this information to find the show very easily, and get awesome business advice from my guests. I am wondering if you are able to let us know where to find the guide to manufacturing personal care products that Eric mentioned? This was extremely interesting an helpful. Building a unique brand with an authentic message and voice is powerful stuff, and Eric’s success is a measure of that. I learned a lot. Thanks! These interviews are great! Thanks for the resource! Great stuff! Hearing other entrepreneur’s start up stories are always a gift. Thanks for sharing!